The down was evenly distributed and it fluffed up in about a day from when I unpacked it. Seems to be very good quality. Exquisite year round comfort awaits you with our down comforter is. 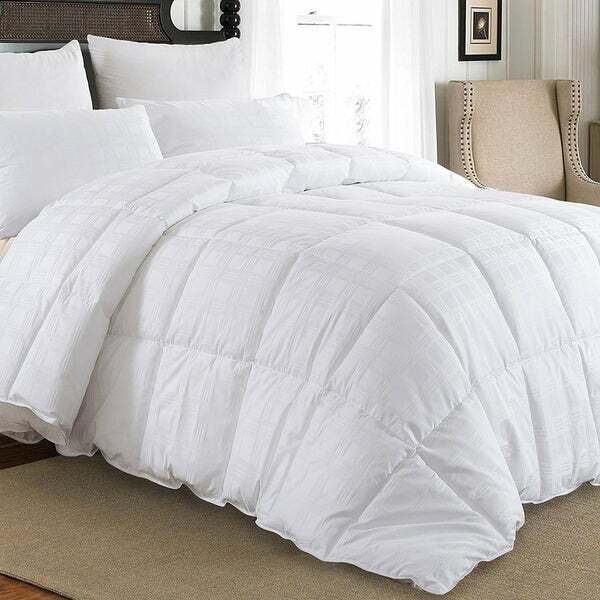 This luxury white down comforter is fuffy,warm,soft and comfortable,works for all your seasonal needs. Designed with true baffle box construction keeps the down evenly distributed. The natural filling offers both adequate ventilation and insulating warmth. You will believe you are truly covering with a cloud, night after night. Hypoallergenic - Certified to be free of harmful chemicals, dust mites, allergens and chemicals. Dimensions 98.0 In. X 90.0 In. I was a little worried when I took this item out of the package that it wasn't going to "fluff up" the way I wanted as it arrives very thin, but after washing and drying the item and letting it lay open for a while it fluffed up nicely. Since the decoration on the cover is so nice I intended to not use this with a duvet cover but was overwhelmed by the amount of fibers that were coming through the cover so it needs a duvet cover. Overall its a nice product and the cover is soft, but beware of the smell (which will fade) and the amount of fiber that will come out. This review was written by a full-time Overstock employee. I received this product for free in exchange for my honest feedback. This is the softest most amazing down! It's larger than I expected, it's warm yet not too warm and my kids love it! Definitely going to buy myself one now!! !